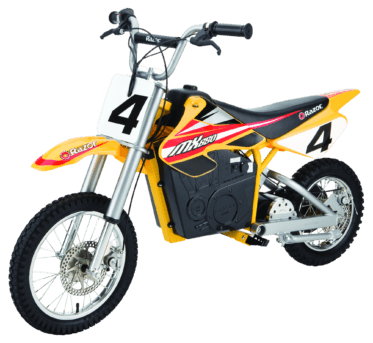 Authentic dirt bike frame geometry, large pneumatic tires and a high-torque, variable-speed motor deliver a super-charged off-road experience. Riding the Dirt Rocket MX500 is one way to feel like a motocross superstar. Feature hand-operated, dual disc brakes for enhanced control. Great bikeI got this one for my son 1-1/2 yrs ago. He was 7. He rides that thing all the time. Very well made, very durable. Just keep battery charged. No issues ever. This summer moving up to the MX 650. This is one of the best items Razor makes!I love the MX500! These are powerful, quiet, have real suspension, and are super fun to mob through town without making a bunch of noise. Highly recommend!